I have found that I can get many more servings from a turkey or chicken when I get creative. For this recipe the only tools you need are a sharp knife, a large bowl and a kitchen scale that will weigh a tenth of an ounce. The seasoning is salt, Marjoram, celery seed, and black pepper. 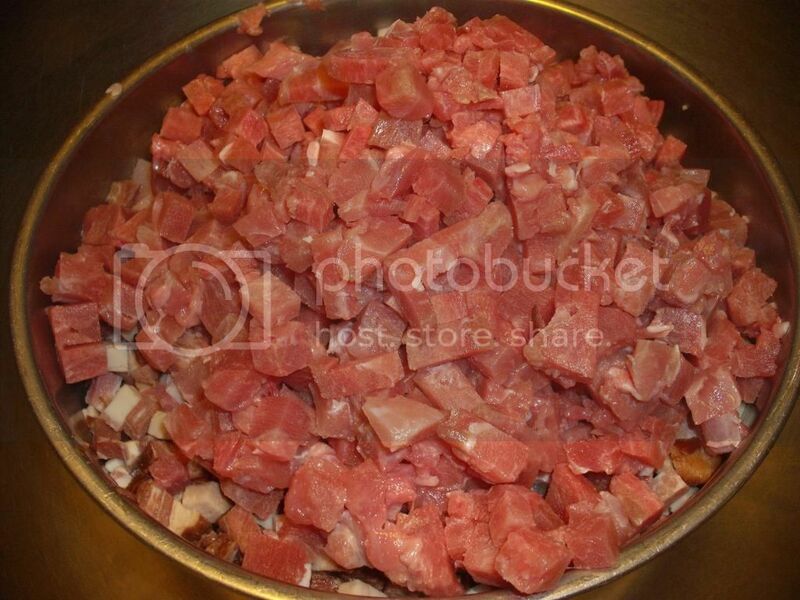 I used 5 pounds of boneless turkey mixed breast thigh and drums all of it raw and frozen. Frozen meat when allowed to warm up to about 30 degrees is as firm and easily sliced as an apple. I sliced half of the meat about 3/4 inch thick and cut those slices into cubes, About a quarter of the meat I sliced about 3/8 thick and cubed that. The rest I sliced about an 1/8 inch and diced those slices. This will be seen in the pictures. 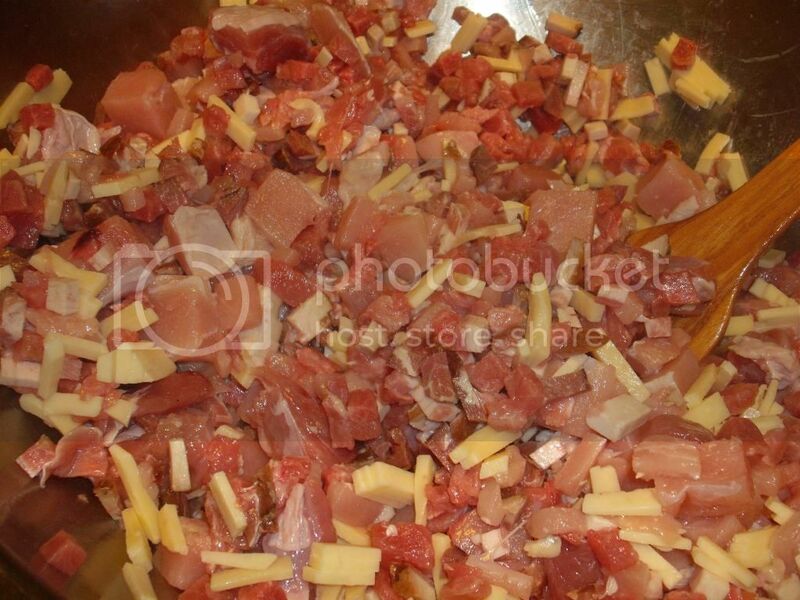 I coarsely grated 12 ounces of cheese, I have used cheddar but for this I used Emmenthalier. 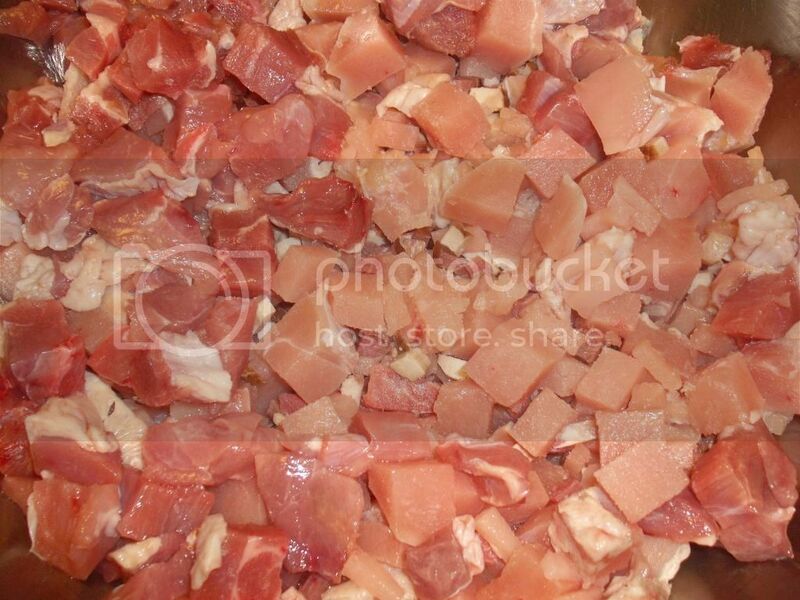 I cut 12 ounces of slab bacon into small dice and mixed all of this together. The seasoning was: salt 1.5% 1.25 ounces; Marjoram 1.5% 1.25 ounces; celery seed 1% .8 ounces and black pepper 1% .8 ounces. I ground the pepper in a coffee mill, blended the seasonings and sprinkled them by tablespoonsful of the meat as I mixed it. 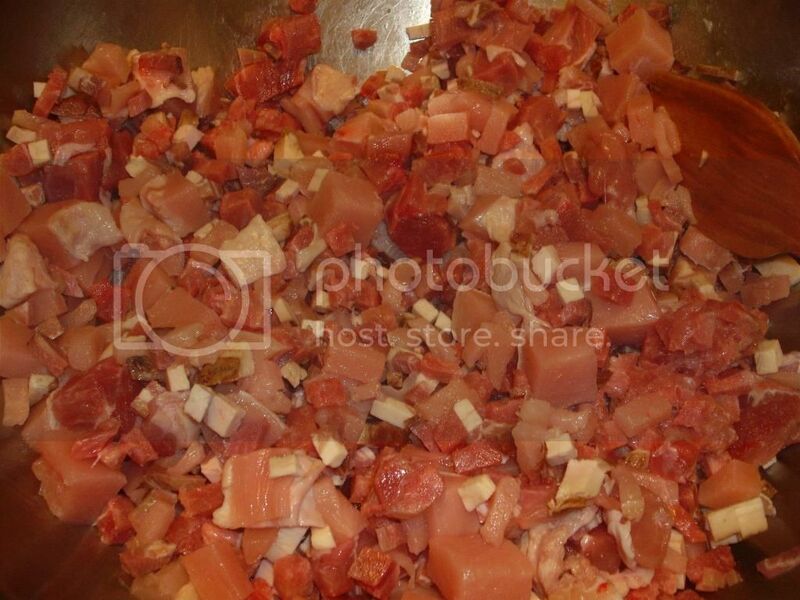 It must be mixed until the cheese, bacon and spice are well distributed and the meat is very sticky. 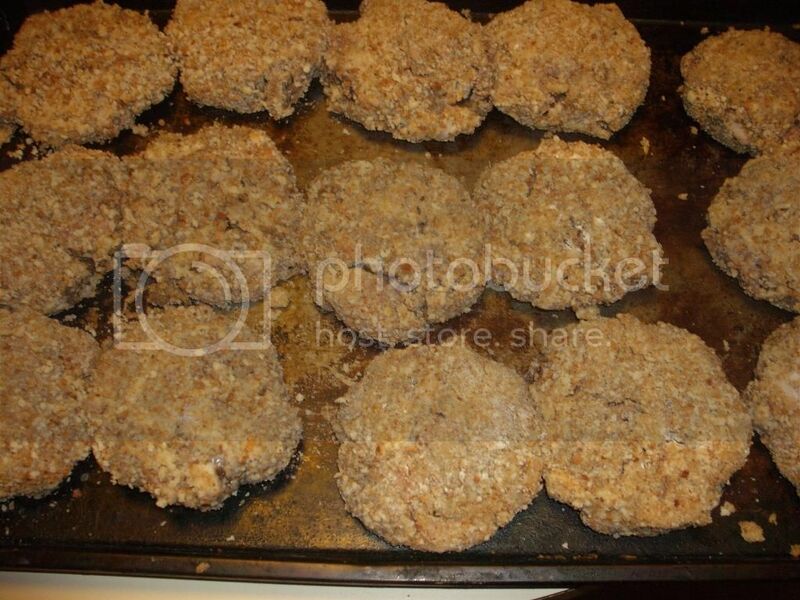 I use a 1/3rd cup measure as a scoop and formed patties that I placed in a pan of flour, then dipped in a milk/egg mix and them coated with dry bread crumbs. To serve I brown them 2 minutes on each side and finish to 165° inside temperature this takes about 10 minutes in a covered skillet. This effort made 32 patties at 4 to 4.8 ounces each. Ross these sound and look delicious. So much easier than the "real" method, flattening the chicken, stuffing, etc. Work like you don't need the money, love like you've never been hurt and dance like you do when no one is watching. Also much better portion control. and many more portions from a bird.